The lawyers for David Letterman and the man accused of trying to extort $2 million from him jousted verbally on "The Early Show" Wednesday, the day after a court appearance by Robert "Joe" Halderman. The attorney for Halderman, who's a CBS News veteran, insists his client just wanted to sell a screenplay. But Letterman's lawyer says it was blackmail, and that the star is "absolutely" ready to testify in any trial of Halderman. That prospect, observes CBS News Correspondent Kelly Cobiella, "is certainly an interesting question -- and at least right now, when no one's talking about a plea deal -- it's a possibility." During the point-counterpoint-type discussion on the show Wednesday, Halderman's attorney said Halderman wouldn't accept a deal if one were to be offered. The defense filed motions Tuesday seeking dismissal of the entire case, and the judge has said he'll rule on those motions in January. Letterman has admitted on his show that Halderman "knows creepy stuff about me." Taking the stand, notes Cobiella, could lead to more embarrassing revelations about the sexual affairs Letterman admits he had with female staffers. And Halderman's lawyer, Gerald Shargel, says he relishes that possibility, saying outside court Tuesday, "I think any lawyer who's been out of law school for more than 15 minutes would be anxious to cross-examine Mr. Letterman." Letterman's lawyer fired back, saying outside court that Letterman's not on trial, but is a victim of classic blackmail who's ready to testify. "Mr. Letterman is fully prepared to see this case through to the end," Daniel Horwitz told reporters. In documents filed in court Tuesday, Halderman charges he "requested $2 million for the full rights" to a screenplay he decided to write about Letterman after he learned his then girlfriend, "Late Show" staffer Stephanie Birkitt, was having a sexual relationship with the comic. "A hard-driven, arm's-length commercial transaction does not constitute extortion," says the defense. Letterman's attorney disagrees, describing it to reporters Tuesday as "classic blackmail, no matter how Mr. Halderman's lawyer wants to dress it up." 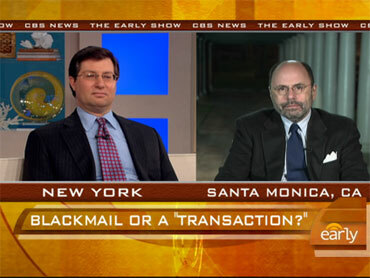 On "The Early Show", Shargel again insisted all of Halderman's actions constituted an effort to bring about a "legitimate business transaction," but Horvitz said "compelling evidence" would come out that Halderman was indeed trying to extort Letterman. Horvitz said Letterman is "absolutely" ready to testify against Halderman. And Shargel said the next thing to happen if the judge rejects the motions to dismiss the charges against Halderman would be a trial -- because Halderman wouldn't cop a plea if that possibility were to emerge.